What is the error or issue when your client goes to Write>Email (from template)? In my testing, I would get the "Object reference..." error, then an unsupported interface error referring to iMap. Found out this was due to click-to-run (streaming) version of Office 2013. If they installed Office and during the install got a message they can start using right away while it was till installing, then that is click-to-run. "act could not retrieve imessage"
Yes, that is correct, when she Go to Write>Email (from Template) all else is okay. She has already installed the DesignR1 plug-in for MS Office 2013, maybe that is the difference? 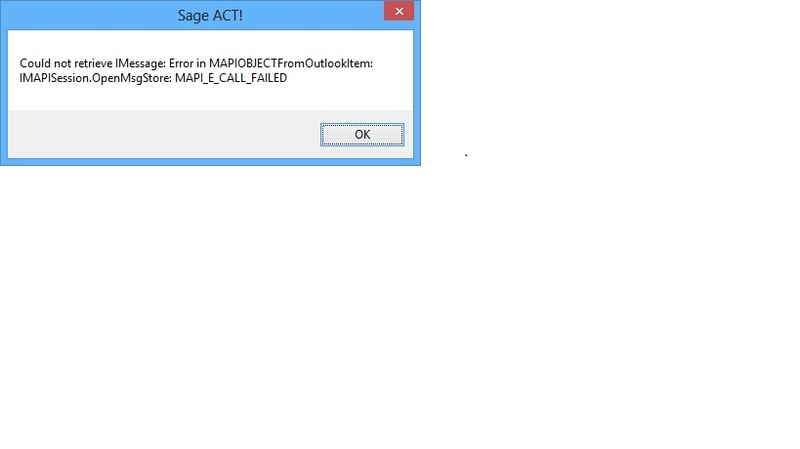 Here are screenshots of the errors I am still getting for Act 2013 and using Office 2013 Home and Business. Reinstalled Office and confirmed local copy, additonally resycned Act with Outlook. Lastly, the Write Email from template produced the sames errors. We just upgraded to Act 2013 due to incompatiblity with Windows 8 and now this is happening. Is there any soltuions for this? 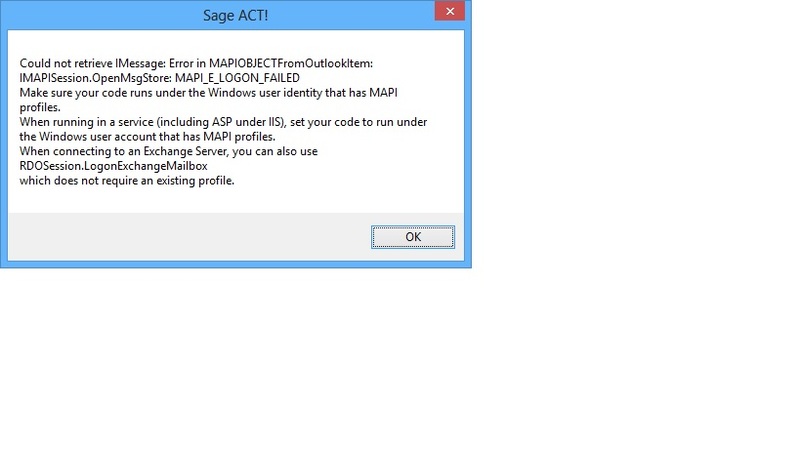 anyone have any ideas or do I have to somehow get office 2010 so that I can actually send emails through Act? You indicate that you have build 15.1 installed, do you recall if you applied the Service Pack 1 update after the initial install, or if it was included in the original install? You mention that you have reinstalled Office 2013 to ensure it is a full install, the errors indicate ACT! can't find those Office components. Try reinstalling ACT! so that it can go back through the integration setup with Office. The reinstall would need to be Sage ACT! 2013 with Service Pack 1 included. If you need a link to that, reply here and I will send it to you. I have the same errors as posted above. I have 3 computers running a shared act database. All Win7 Pro. Also all the computers are running Office 2013. Two computers work flawlessly but one computer refuses to email, yielding the error messages. I believe that this shows that this error has not so much to do with office click to run as it does with some other factor. All three computers have worked while using office 2007. Now in addition I just went to replace one computer today and everything was a fresh install. Same error. So now I have two working and two not. I find it annoying that there is no way to contact Sage on the weekend as the program is an integral part of my business. Act 2013 is running on ALL machines with SP1 already loaded. Also all other suggestions in this forum have been attempted and failed. I'm hoping that some constructive solutions could be provided. I've just encoutered the same error for one of our clients. The message is "Could not retrieve IMessage: Interface not supported"
This is on a new Windows 7 computer (64 bit OS but 32 bit Office) Office 2013 and ACT! 2013 v15.1 (full install). I found the KB article (Answer ID 23848) and I'm fairly certain this is not a mapi32.dll problem. I'll check back here to see if anyone comes up with a solution. I'd appreciate suggestions for workarounds as well. Be sure to check the installation directory (64-bit OS), to see how many files are included: C:\Program Files (x86)\Microsoft Office\Office 15. If there are only a handful of files, it is not a full install of Office (it is a click-to-run/streaming installation). What does "click to run" MS Office mean? I purchased Office 2013 from Bestbuy and downloaded from MS website. I was under the impression that it is a "full" version but reading this post by ghollister makes me wonder. I cannot sync Outlook 2013 (which I ended up buying separately after Office) with ACT 2013. When I look at my Office Account and click on Office Updates / Update Options / view updates, it takes me to a MS sight (http://support.microsoft.com/gp/office-2013-click-to-run) entitled Microsoft Office 2013 Click-to-Run virtualization. I don't know what that means but is it true that I cannot sync ACT 2013 and Outlook 2013?